I was recently inspired by the video below which stemmed from a GradNation report about why students really leave high school. It features student voices, explaining, in short, that they don't leave because they don't care - it's often because life gets in the way. I've heard very similar stories when it comes to community college students. The tagline for this blog (see above) was inspired by just that - I've found it's often life circumstances (not any inherent levels of intelligence) that make the difference between those who go to community college versus straight to a four-year university. The GradNation Report, "Don't Call Them Dropouts" lists some important ideas for making sure we don't miss out on the talent of students for whom life makes education more difficult than some of us can ever imagine. "To meet long-term goals like staying in or going back to school...young people needed more than their own perseverance; they need to 'reach up. '...young people began to thrive academically, socially, and emotionally when they were able to connect to individuals and institutions that support them." I believe this idea is transcendent - we all need to feel supported and connected in every stage of our lives; but it seems that strong foundation is crucial in our earliest years. Some of us happen to be born into situations where we get support and connection directly from our families and communities. But too many are left behind and then judged without considering what they've had to endure. I love the idea of "reaching up," as if you've read my book you know that's what it's all about. Most of my work revolves around the idea of teaching students how to reach up, how to ask for help, and why no one is successful alone. It's so easy to tell ourselves that if we aren't successful in a particular moment that maybe it means we're just not cut out for whatever that thing we're trying to do is (e.g. like if you fail a test or drop out of high school). However, most of the time it might mean you just don't have the right supports and strategies. 1. Who do you need to "reach up" to today to ask for help in accomplishing your #1 goal for this year? If you're not sure, think about something you really want to accomplish, and then ask yourself how you can find someone who's already accomplished it to ask for their advice. Some great places to start looking for that person are: LinkedIn, Twitter, teachers, professors, family members, alumni networks, and your college career center. 2. What organization in your community can you reach out to in order to become a mentor to a high school or college student? If you're not sure, check out this awesome search tool via Mentoring.org to easily find mentoring organizations in your community. Can you imagine what the world would look like if each one of us reached up and out? I encourage you to get going today so you can see what happens when you decide to build a community to support your own success, and then use that success to help support the success of others. It's one of the most beautiful cycles there is. 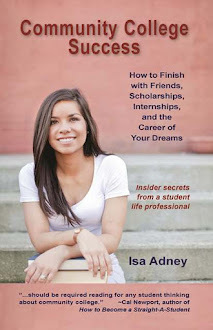 I completely agree, Isa Adney! When I started my college education at a local community college due to my own personal life circumstances (lower grades in high school as a result of bullying followed by a sense that I was learning nothing significant in school), I finally felt that I had a greater sense of control over my education. Due to my issues with stress in high school, I decided to test the waters by starting studies part-time, adding on a class each semester until I began to take roughly 15 hours per semester. Even in my final 3 full-time semesters at the CC, I managed to pull off As in all of my classes, earning my Associate of Arts with highest honors. Not only that, but I got involved in Phi Theta Kappa (including a chapter officer position) and a business-oriented leadership development program offered at my CC! But that's only the first step! Starting this August, I will attend Texas Christian University (TCU), and I plan to get involved in extracurricular activities (especially research) as soon as possible. But I will take my first semester to adjust to my new environment and buffer any possible transfer shock.